Last week I had some chances to capture sounds of ice down by the lake, this time from some different perspectives. First out is a recording I made last Saturday with my NT1-A’s in a stereo array. 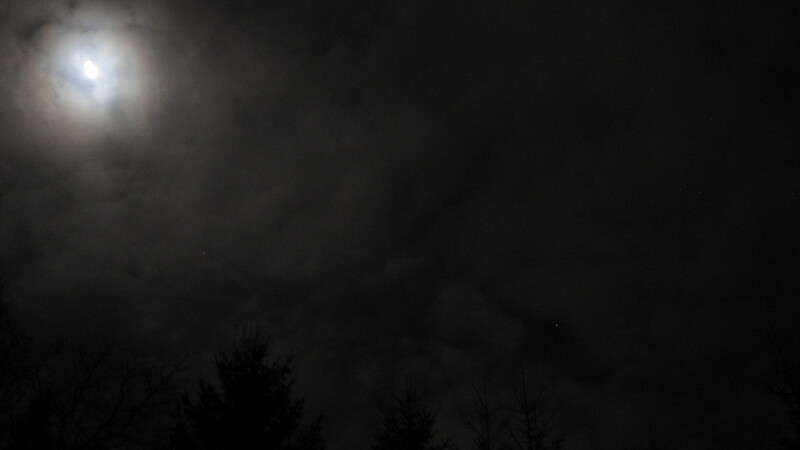 It’s recorded just after midnight. The conditions were good, with temperatures dropping to below -15° Celsius and no wind. The only disturbing element were an aircraft that just wouldn’t go away. I tried to wait it out for more than an hour but finally gave in and made the recording anyway, hence the low-frequency hum coming from the right. As in the case with my earlier ice recording this year I did some cut and paste this time as well, the original recording spans about 30 minutes. I really find some of these sounds to be very nightmarish. The other three recordings were made yesterday. As me and Matilda were on our way home after a day of ice skating on the lake I noticed some intense ice movements. At home I switched the skating gear in favour of the recording gear and then headed back down to the lake. The sun was setting as I arrived and some guys that had been out ice fishing on the middle of the lake were leaving. 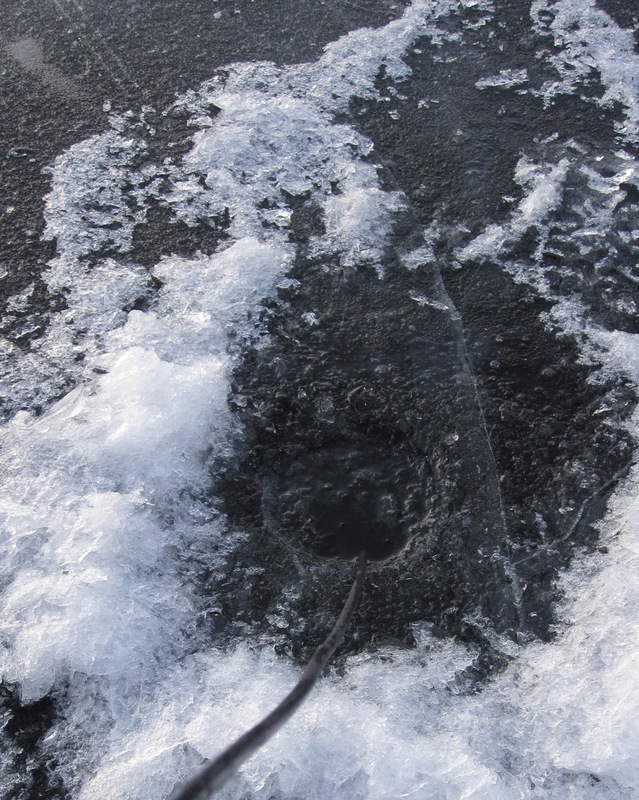 So I went over there and used one of their holes to get below the sheet of ice with my hydrophone. These recordings are not manipulated in any way, the activity going on where so intense I could actually feel the ice moving underneath me. In the second recording the hydrophone is lowered about 10 cm’s into the water, centering it in the 20 cm thick layer of ice. Be advised that some of the sounds in this recording are very loud. In the last recording the hydrophone is lowered about 1 meter into the water, positioning it about 40 cm’s below the sheet of ice. Of these three hydrophonic recordings I’m most fond of the last one as you’re able to hear distant sounds as well as close by cracks very clearly. It’s also a bit warmer to the tone than the second one. I just wish I had a second hydrophone for stereo recordings. fan vikka häftiga ljud! Håller med om att den tredje undervatteninspelningen är den bästa med hydrofonen, men Nt1 inspelningen är sjukt bra. Så jäkla spöklik, tycker inte att flygplanet stör alls snarare tvärtom. There’s a nearly cinematic suspense in first recording, very impressive. So amazing! It all sounds so electronically produced, like some beats by Bjork. I imagine it’s very mesmerising sitting there and listening to it. Can you hear it from the surface without microphones? Yes, you can hear the zapping sounds and the cracks when being close to the lake. If listening from a distance you’ll be able to hear violent bangs as well as rumbling low frequency sounds, that is from several hundred meters away. When living pretty close to several small lakes, as we do, the sounds of ice really puts a nice flavor to the silence of winter. These are magnificient recordings! I never heard anything like this! I should try to borrow a summerhouse close to lake Thingvallavatn to find out if something is going on there. Congratulations!